The Sidebar: The Natasha Stuckey case, Cincinnati, June 25, 1993, Part II: Where are the news reports? And where's my father's missing desk? The Natasha Stuckey case, Cincinnati, June 25, 1993, Part II: Where are the news reports? And where's my father's missing desk? Part I of this series consisted of a review of all known articles about the Natasha Stuckey case: an opinion column in the Cincinnati Enquirer, a CBS This Morning TV feature, and some passing references in articles by my father and by my mother. To my knowledge, the Enquirer and CBS stories are the only original reporting about the case. This installment is my analysis of those two stories and resulting questions. I usually blog short items, but this one's long and requires your concentration and time, probably about fifteen minutes worth. I didn't want to split this into segments, so readers with short attention spans: consider yourselves warned. Before going further, in order to better grasp the material, I recommend you first read both stories and keep them open on your desktop for easy reference. 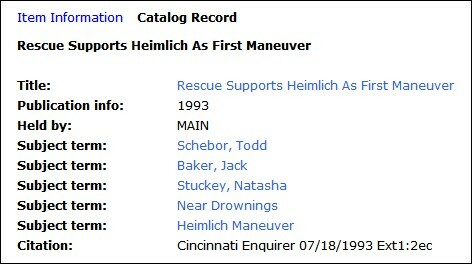 Click here for the July 18, 1993 Enquirer column by business reporter John Eckberg, Rescue Supports Heimlich as First Maneuver. Click here for a transcript of the July 16, 1993 CBS This Morning story by medical correspondent Howard Torman MD. (Todd) Schebor, president of Schebor Landscaping Services, and (Jack) Baker, an employee, were working at the Kugler Mill Square Apartments on Beech Street in Bond Hill at 2 p.m. on June 25 when Natasha nearly drowned. He pressed against the girl's abdomen with his fist, which pushed her diaphragm upward and compressed the lungs - forcing out water. On the third try, vomit and water completely cleared from the girl's airway, and she started breathing again. Here's what I consider to be a fundamental concern re: the two stories. 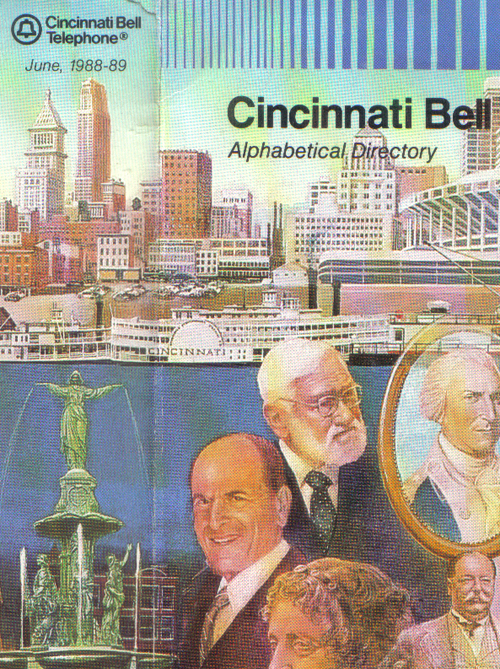 Database and library microfiche searches of the Enquirer, the Cincinnati Post, and other Cincinnati and national news media failed to produce any news reports about the event. In other words, it appears that the only published stories are Eckberg's column and the CBS feature. In my opinion, the apparent absence of news reports about such a dramatic series of events is conspicuous. It's no secret that drowning and drowning rescues are a staple subject of broadcast and print news, especially during swimming season, of course. For example, click here for a Google News search with the keywords "drowning" and "lifeguard." Cincinnati has a string of TV news stations and in 1993 the Queen City still had two daily newspapers, the Enquirer and the (now defunct) Post. 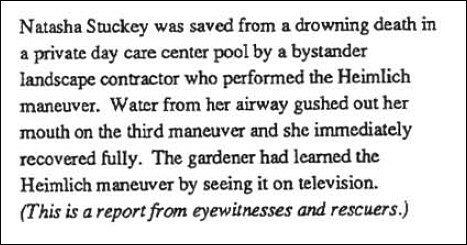 Only weeks before June 25, 1993 - the date Eckberg ascribes to the Stuckey rescue - both papers had closely reported a high-profile campaign by my father. If I've got it right and there weren't any news articles about the Stuckey case, that means Cincinnati reporters were asleep at the wheel. It also raises this question: where did John Eckberg and CBS obtain the information? For example, what was Eckberg's source for the date, time, location, and other facts he provided about the case? Re: the CBS story, it's common for "good news" rescue stories like this to include video of the child and her grateful family. But Natasha Stuckey's name isn't even mentioned in the CBS story (which consists entirely of interviews with my father, Todd Schebor, Jack Baker, and a representative of the American Red Cross). Eckberg, a business reporter, had Natasha's name, of course. He didn't, however, mention either of her parents, Cheryl and Tyronne Stuckey, a prominent business owner and philanthropist in Cincinnati. Also, how did the two stories end up appearing in mid-July, about three weeks after the rescue date (per Eckberg) of June 25, 1993? Of course, this line of inquiry relies on the assumption that no other stories were reported. I've done my best to be thorough, but I could have missed something. 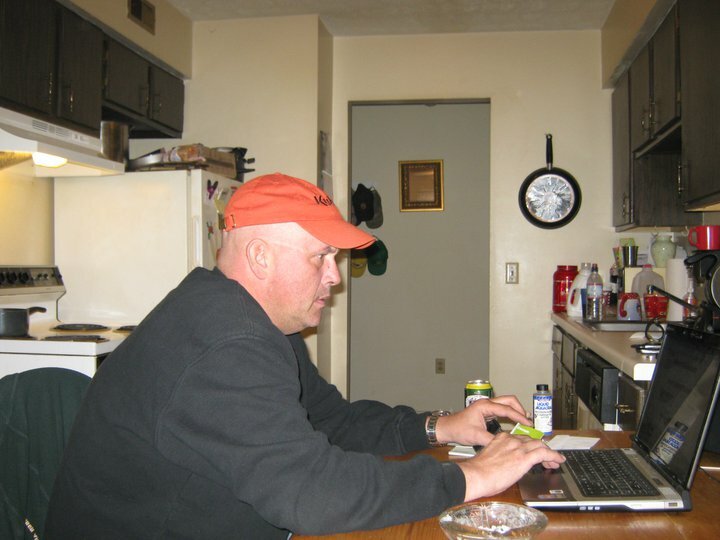 If so, I invite readers - including John Eckberg and the Stuckey family - to steer me towards any additional information. If warranted, I'll do a follow-up. But in my opinion there's more about the situation that doesn't jell. My father's no slouch when it comes to generating media attention. Since introducing the Heimlich maneuver in 1974, he's done scores of photo ops and TV appearances, including as a guest on The Tonight Show with Johnny Carson and Late Night with David Letterman. A Newsbank article search of "Dr. Henry Heimlich maneuver" resulted in almost 1100 hits. Click here for for a tiny sampling on the Heimlich Institute's website. "My father is such a brilliant promoter, he could teach P.T. Barnum a few tricks." That's why I can't understand why he didn't capitalize on the Stuckey case. It was heaven-sent for his crusade to promote the Heimlich for drowning, especially right after council gave him the bum's rush on his city lifeguard push. Better yet, it reportedly happened in his home town. 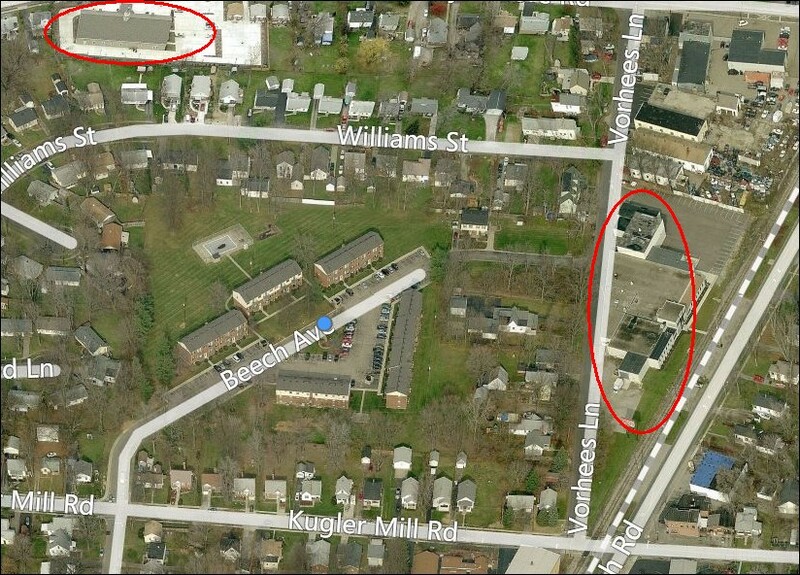 What could be more convenient for Dr. Barnum? Where are the print and TV stories with the Stuckeys thanking my father and the rescuers for saving their daughter's life? Where are the photos of my father and young Natasha? Where are the stories about my father presenting a Heimlich Institute "Save-A-Life Award" to Todd Schebor and Jack Baker? "This is a report from eyewitnesses and rescuers"? That's a problem for me. My father has carte blance access there. Wouldn't he have interviewed the paramedics and physicians who treated Natasha and been given the opportunity to review her medical report? Wouldn't he have interviewed Schebor, Baker, and eyewitnesses on the scene? I'm unaware of any indication that he did any follow-up on the Stuckey case. If he didn't, why not? There are some other interesting questions raised by the details in the Eckberg and CBS stories. "(The) two men were mowing the front lawn...a crowd of adults and children gathered and began to scream for help at the pool." Over the sound of their lawn mowers, at such a distance, and separated by a building, how did Schebor and Baker hear the screams from the front lawn? (They) hurried to the water and found a lifeless Natasha. Were the "crowd of adults and children" just standing around the pool, screaming and gawking at the floating body? In the photo, the pool appears rather small and probably not too deep. Why didn't the bystanders jump in and pull her out? Was Schebor among those 16 million? It's possible. But if so, why would he need to run to make the call? Because his phone was in his truck? If so, that means he'd have to run from the pool, back across the field, around the building, then to the parking lot. How much time would have been required to reach his vehicle and make the call? If he didn't have a cellular, he used a phone belonging to someone living in the apartment or found a pay phone. The first option doesn't make sense. If he found someone with a phone, why would he make the call himself? He'd instruct them to make the call so he could race back to the pool, right? 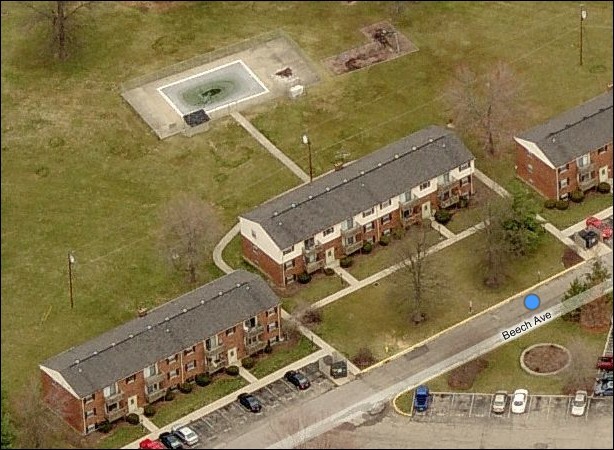 If he used a pay phone, there may have been one at the apartment complex. Otherwise, based on this photo, the closest commercial areas where he might have found one are a pretty fair distance on foot. Long story short, how long did it take to find a phone, make the call, and get back to the pool? And why didn't he pull her out of the pool before dashing off to make the call? (Schebor) returned and within seconds began to perform the Heimlich maneuver. Why the Heimlich and not CPR? Those who might not expect a landscaper to have such a keen interest in the subject of resuscitation clearly need to adjust their expectations. Mr. SCHEBOR: You can blow as much air as you want, but I—I suspected that seeing the amount of vomit in her mouth and her nose, I knew that she had water in her lungs, and CPR don't go through water. It's not known how Schebor arrived at this erroneous conclusion, but its one he shares with my father. Dr. Linda Quan, who made a presentation to the same committee, remembers the looks on the faces of oncologists who heard Heimlich...describe the impossibility of ventilating through fluid, a feat doctors accomplished with newborn babies every day. That's five months after the reported date of the Stuckey case, plenty of time for my father to interview all the parties and to present it along with other cases he submitted. But there's no mention of it in the 30-page report issued by the IOM. TORMAN: To convince others, Heimlich has made a public service announcement encouraging folks to use the Heimlich maneuver first, an announcement Todd paid attention to. Mr. SCHEBOR: It was a gut instinct, and it was also just like a flashback of seeing Dr. Heimlich behind his desk saying do the Heimlich in a drowning case first. Schebor must have had a different flashback. Here's the PSA from which he claimed to have obtained his inspiration. It takes place entirely in a swimming pool. Therefore, if Schebor heard my father "behind his desk saying do the Heimlich in a drowning case first," it must have been on another occasion.